Ruby on Rails has been my favorite for long time and since 2nd edition of this book. This latest 4th edition is a huge improvement since the last edition I bought, So great great thanks to Michael for publishing such an easy to follow and understand book. Web Development with Rails has never been more fun with this book which is easy to read and follow! Great book, I would say that is a K&R for Rails. Written in simple English, gives a lot of knowledge. Highly recommended to learn Rails. I'm new to programming, but I've spent a fair amount of time looking for decent resources to learn Ruby. While there are plenty of free introductory resources that go over the basics, there aren't many that bridging the gap to Rails. I haven't yet finished this book, but so far I've learned to create simple apps fairly quickly. Instructions are clear and concise. I also like the web interface and associated tutorials on git, command line and text editor. The best Ruby resource for newbies by far. The ROR Tutorial is one of the (very) few tutorials that understands that when you are a complete newbie everything has to be spelt out clearly otherwise it is easy to leave people behind. You will actually get a finished app at the end of this tutorial because everything is communicated so well. This book is the best resource I've come across to learn Ruby by far and I am constantly referring back to different sections as I need them for other projects. 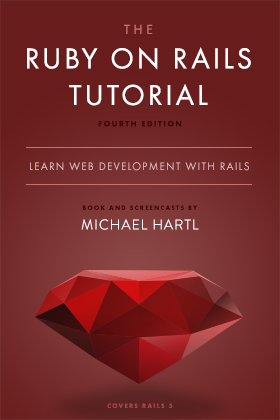 The only rails5 learning materials you must have is this book. I hardly find a good one on the internet after spending weeks and I end up here. I've gone through ever part of the book and it covers everything I have to know. It is highly recommended to read and if you like, video training accommodates this book is a great help as well. I've wanted to learn Rails for a while and finally got round to it this June (2016). I had been using various resources to learn and all were good. Then I came across The Rails Turorial, I started reading it and it immediately helped me pick up rails quicker than other sources. This updated version expands on the previous versions well and covers a lot of the newer features of Rails 5. I really couldn't recommend this enough especially for people just starting out it will help you grasp the basic concepts quickly! Just a phenomenal book. I am a relatively newbie to these online courses and believe Mr Hartl might have found his calling..Five Stars!! Thanks for putting the knowledge out there and I hope I can get to honor the license some day. The famous Ruby on Rails Tutorial (Rails 5) is the best release so far and Hartl does an outstanding job going over what's new in the latest release of Ruby on Rails. This tutorial was officially used as part of my training in using Ruby and Rails. I returned to it to write my first personal "fun" app and I return it again and again for the clear explanations and friendly encouragements to plan, design, test, implement and generally make pretty. Ruby, Rails, Bootstrap, git, wire-frames, and on and on. It is a great exposure not just to nuts and bolts information, but to a general approach to coding that is refreshing and informative. Of all the tutorial books I have used over the years (and that's quite a few), this one is top-notch! The instructional writing is clear, and the code snippets well explained. I especially appreciated the introduction (for me, at least) to Test Driven Development. Michael makes it clearly understandable. I seen very rare book you love and wants to read again and again. I am reading this Book / Tutorial from Rails 3.2 (updated 2nd edition). This book, more than any of the others I've tried, lays out a methodical, understandable roadmap to start with no subject knowledge and end with a comprehensive understanding of the platform and language behind it. Really excellent way to start learning how to program and to learn to teach yourself. The tutorial provided very detailed workflow for web dev beginners with a test-driven development approach. It has a very clear explanation about Ruby common practices like scaffold, etc. and selects beginner-friendly modules with good documentation throughout.